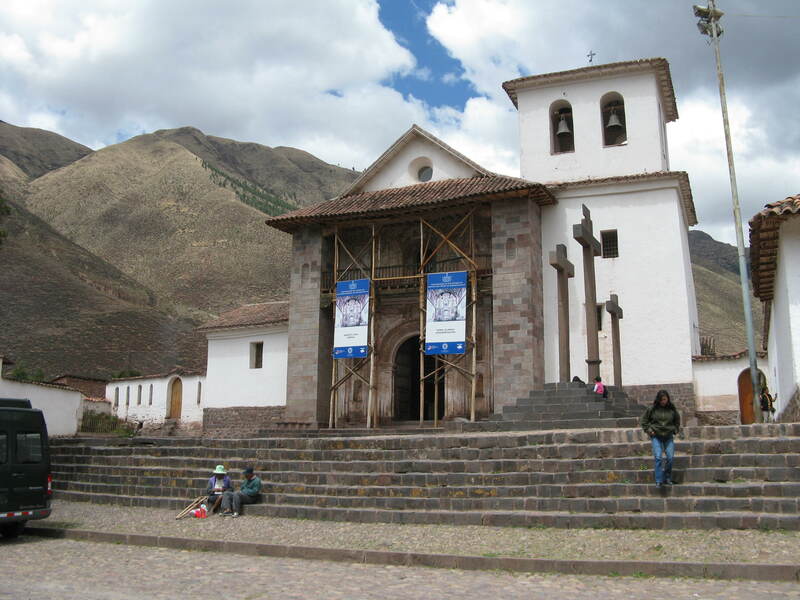 The church San Pedro Apóstol was built by Jesuits between 1570 and 1606 over an Inca huaca (sacred space) in the small Andean town of Andahuaylillas 25 miles west of Cuzco. 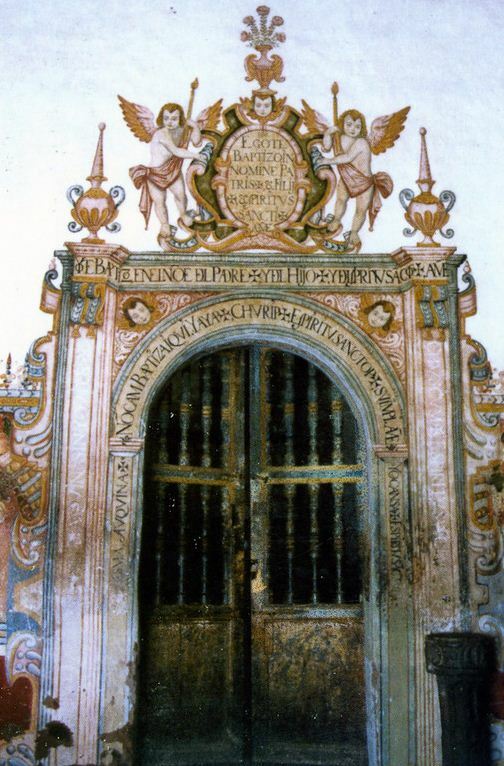 The Jesuits had arrived in Peru just two years earlier, in 1568, and promptly set about building churches and schools in the remote towns and villages which the Dominicans who arrived with Pizarro in 1532 had not reached. San Pedro Apóstol’s architecture is simple: one nave, one apse, a bell tower, in whitewashed adobe and brick construction with a modest mural on the second story balcony of the facade. 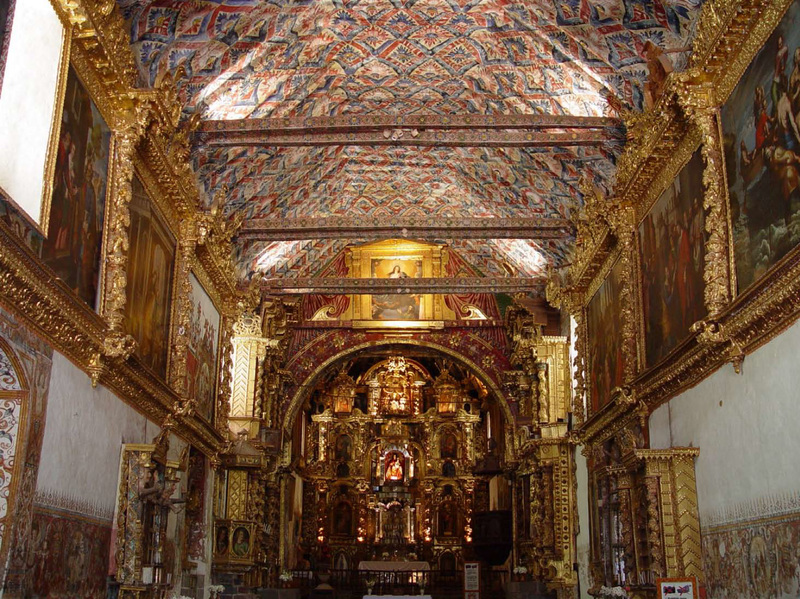 On the inside, however, is an explosion of colors, saints, allegories, gold leaf, geometric and floral designs which has rightfully earned it the nickname “the Sistine Chapel of the Andes.” There’s hardly an unpainted spot to be found from baseboard to ceiling. Although Jesuits oversaw the decoration of the church, over the decades they enlisted teams of highly skilled indigenous artists and some famous names like Diego Quispe Tito, scion of a noble Inca family and leader of the Cuzco School of painting, and the Lima-born, Italian-taught Spanish painter Luis de Reaño who in 1629 created murals at the entrance depicting the roads to Heaven and Hell in Mannerist style. Canvases of scenes from the life of St. Peter are set in massive gold frames along the walls. Amidst the traditional Christian figures of saints, the walls and ceilings of the church are filled with Andean flowers, fruits and geometric patterns. The coffered ceiling of the vestry was not made out of wood, but through a pre-Columbian technique called kur-kur that combines cane, straw, and mud to create a surface that looks like wooden beams in some angles and like undulating fabric in others. 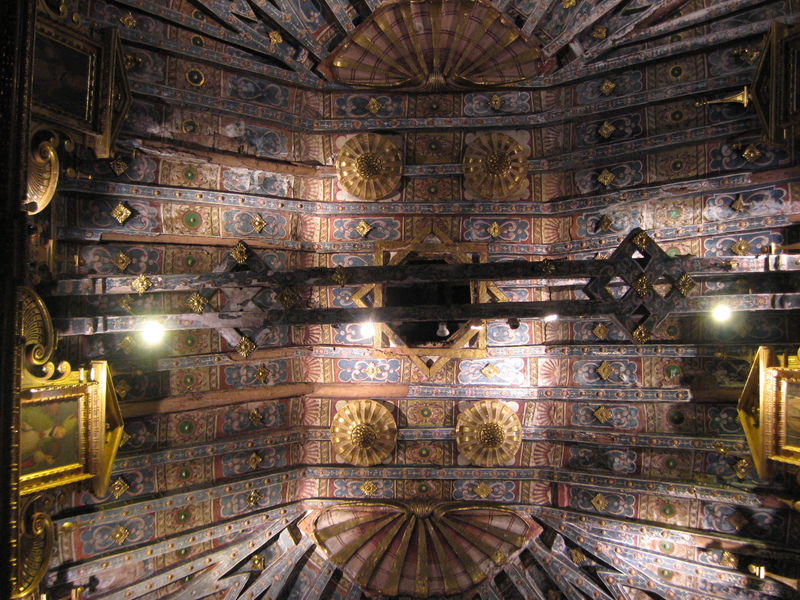 The kur-kur ceiling was then painted in the polychrome Mudéjar style, an Iberian style heavily influenced by Islamic art in use in Spain between the 12th and 16th centuries. The indigenous artists altered it to include far more florals along with the Moorish rhombuses, squares and large central octagonal star in keeping with the local aesthetic. Gold leaf accent pieces are scattered throughout. Elements of traditional religion are also included in the decor, a syncretism that played an evangelical role since it smoothed over the rough edges of conversion from the Inca deities to the Christian ones. For example, in the Annunciation painted above the choir the Holy Spirit is represented not by a dove, but by a hole in the wall. The sun shining through the hole brings the Inca sun god Inti into the church even as it symbolizes the third divine person of the Trinity. 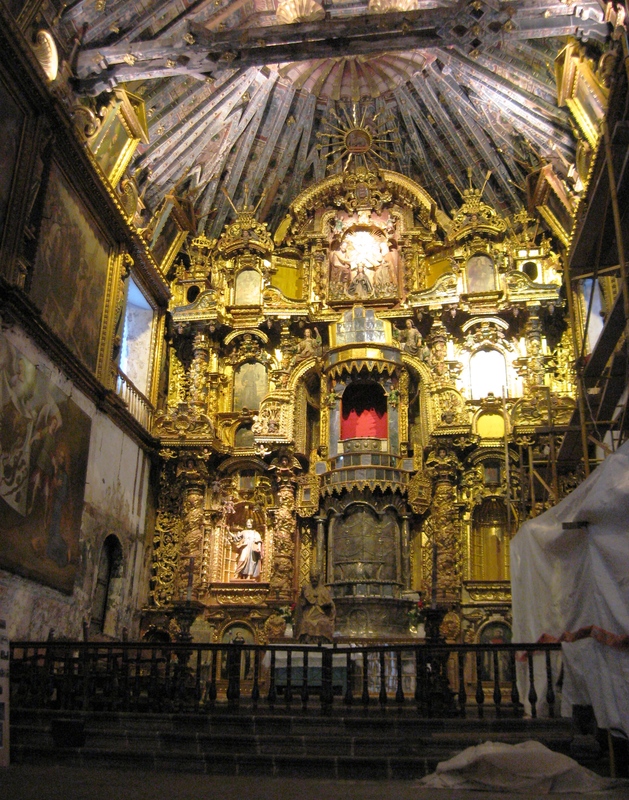 The sun also tops the massive Baroque altarpiece, carved out of cedar then covered with gold leaf, silver leaf and Venetian mirrors. A solar disc with a painting of the lamb of Christ in the middle and 19 gold rays shining out from it rules over all the painted and carved saints and the carved Assumption of Mary. The imagery isn’t the only mechanism of conversion. Above the font in the baptistery is the “puerta de las cinco lenguas” (door of the five languages), which is inscribed with phrase, “I baptize you in the name of the Father and of the Son and of the Holy Spirit. Amen.” translated into five languages: Latin, Spanish, Quechua, Aymara and Puquina. The last of these is extinct today, which makes the inscription even more historically significant. The many beauties of San Pedro Apóstol de Andahuaylillas were in serious danger from earthquake damage, previous restorations that had replaced some of the adobe and caused structural problems, roof leaks, insect infestation and bat poop. 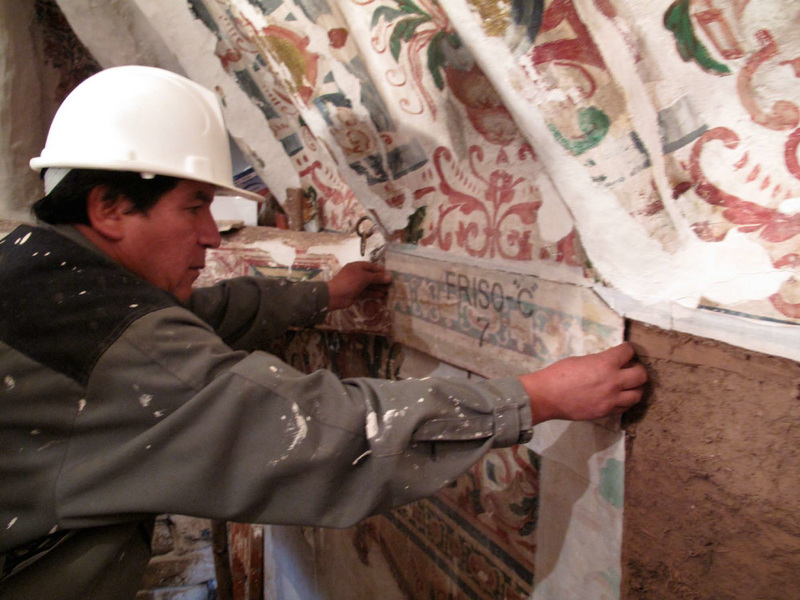 In 2008, the World Monuments Fund stepped into the breach, planning and funding a three-year conservation plan to restore the walls, roof, ceiling and paintings. It was a big job, and the restorers took no short cuts. A large part of the project focused on stabilizing the murals, all of which are executed in tempera, with conservators opting to use organic materials such as liquids extracted from cacti over man-made chemicals. Many murals had been repainted and conservators had to strip back multiple layers of paint to reach the original composition. 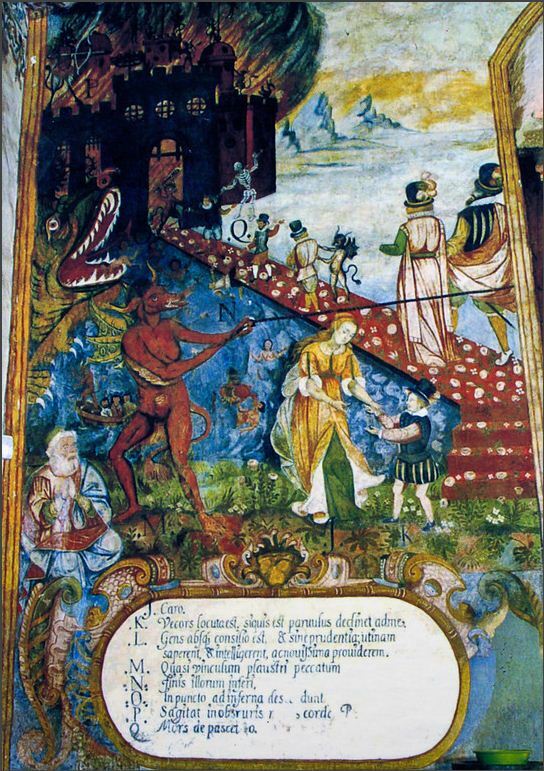 For example, the “Road to Hell” mural had four layers that needed to be removed. Instead of trying to recreate lost murals, conservators chose to paint these areas in a light colour. A 17th-century ceramic pot containing ochre pigment and a wooden brush was discovered during the project, shedding further light on the materials used by the artists. When it came to the decorative ceiling made from mud and straw—traditional construction materials in the region—conservators were faced with removing one metric tonne of bat droppings in the space between the roof and the ceiling. Structural issues such as the replacement of adobe were also addressed, and all of the church’s sculptures, as well as its altars, received treatment. As of October 31st, the conservation of the church is complete. Thinking ahead, the WMF also created a youth heritage program to involve the community’s young people in the process, teaching them valuable skills while motivating them to protect their town’s cultural heritage in the future. Separate from the WMF project, the two organs in the church were also restored. The Gospel Organ (also known as the Saint Cecilia organ) and the Epistle Organ (also known as the King David organ) were installed between 1606 and 1610 and later decorated by Luis de Reaño. In desperately poor condition after centuries of exposure to moisture, they were both restored by the French organ builder Jean François Dupont in 2007 and 2008 and are now back in full fettle. Here they are being played by Norberto Broggini in videos which happily include some great shots of the glorious ceiling and walls. This entry was posted on Tuesday, November 6th, 2012 at 11:03 AM	and is filed under Modern(ish). You can follow any responses to this entry through the RSS 2.0 feed. You can skip to the end and leave a response. Pinging is currently not allowed. I went there today and work on the murals is in full swing. Building is amazing but you can’t describe the restoration as complete, there are about 1 dozen people working on murals as at 20th December 2012.